In Part One, All About Native American Concho Belts AKA Concha Belts, I covered a little bit about the history and makeup of a Native American concho belt. Here I am going to talk about how to go about using that great belt you have hanging in the closet. Concho belts are unisex and can be worn with jeans as well as over shirts, blouses and with skirts and dresses. First I’ll talk about link belts as they are quite simple. Link belts are usually quite adjustable. You would purchase one approximately your waist size plus a few inches. Depending on the style of the belt, you usually can fasten the buckle’s hook on any of the rings between the conchos to get a custom fit. This is especially good if you are going to wear the belt in a variety of ways – over a blouse or shirt or through the belt loop of jeans because you will be able to fit a link belt to its intended use very quickly. Most link belts are narrow enough to fit through the loops of standard jeans. Generally 1 3/4″ wide and less will slide through belt loops. Depending on your waist size and the length of the link belt, you will have more or less excess belt hanging down in the front. This can be left hanging straight down or looped. Leather concho belts are traditional and popular. You need to choose a leather belt that is the correct size for the concho’s loops. If the leather strap is too narrow, the conchos will wiggle out of position. If the strap is too wide or thick, it will make it difficult to slide the conchos. Leather Concho belts fasten in one of three ways. Some leather Concho Belts have a normal buckle with a tongue. With this style buckle, once you find the ideal place to punch the holes for your waist, you can cut off the end of the leather just so it tucks under the first concho as shown in the slide show below. Others leather belt style Concho Belts have a large oval or rectangular “western style belt buckle” with a prong on the back that fits into a hole in the belt. For both of these types of belts, using a leather punch, you will need to punch a hole or two in the leather portion of the belt to custom fit the belt to your size waist. If you have a small waist, you might want to cut some of the leather off the end of the belt and slide the conchos closer together. If you have a large waist, you might want to slide the conchos farther apart from each other. Some leather mounted concho belts have a hook and loop on the end panels such as this one by Dan Jackson. With a belt like this, you would need to slide the panels closer together or farther apart on the leather belt until the hook and loop connect perfectly for your waist size. The leather belt portion of a leather concho belt is usually extra long and blank (not punched) so that you can custom fit the belt to your size. The conchos can be slid along the leather as desired to position them perfectly for your waist size. You can also remove the conchos and buckle from the leather strip provided and place the conchos on a favorite belt that you already own. If you are going to wear a concho belt over an untucked shirt or blouse, you would punch a hole to fit your waist and then arrange the conchos evenly spaced around the belt. To do this, you need two simple tools. A screwdriver and a pair of pliers. Using the screwdriver, carefully loosen the belt loops on the back, just enough so you can slide the concho into the desired position. Then to seat it, place a cloth around the concho to protect it and gently squeeze the belt loop with the pliers to a snug fit. You don’t have to scrunch down real hard because the loops are usually made of copper or silver, both soft metals that bend easily. You are padding the concho so the pliers don’t make any marks on the front side of the concho – or damage any stone or inlay. Be careful when squeezing with the pliers – only enough to get the job done. Once you have the conchos set, you are ready to wear your belt. The situation with a belt that will be worn with jeans is a little more complicated because first you want to be sure the conchos will slip through the belt loops. Generally 1 3/4″ wide and less will slide through belt loops. A few brands of jeans have larger belt loops, I have found that Seven7 Skinny Jeans accept concho belts up to 2 1/4″ wide ! Also, you will want to space the conchos so that they work in harmony with the belt loops. Here for example is one arrangement for a belt that has a buckle plus 11 conchos. If you have to put your conchos and buckle on a new leather strap, simply loosen the loops and slip off the conchos. Most buckles are attached using a 3 hole tie with lace as shown in the slide show below. It is the same tie you use to fasten a latigo to a western saddle. I love to wear concho belts and hope these two articles get you motivated to use yours ! Before buying a concho belt, it is a good idea to know a little bit about them. I hope this helps you with your purchasing decision and will add to your wearing enjoyment. This is Part One of a two part series. Part Two will cover The Art and Science of Wearing a Concho Belt. The word concho comes from the Spanish “concha” which actually means “conch” or “seashell” but has come to mean round or oval disks (occasionally rectangles) of silver used to decorate saddles, bridles, clothing, used as jewelry such as for pendants and bolo ties and for adorning or making belts. Concho belts are a long-time Navajo tradition yet it is generally accepted that the Navajo learned about the concept of concho belts from the Plains tribes. They then obtained the skills and designs to make silver conchos from Mexican silversmiths (plateros) that used conchos on horse tack. The earliest conchos were silver dollars that were hammered, stamped and edged, then slotted and strung together on a piece of leather. Later in the evolution of concho belts, the slots were no longer used. Instead, copper loops were added to the back of the conchos so they could be slipped onto a leather belt. When the slots disappeared, they were replaced by a central design element which continues to be used today. Silver concho belts evolved to include overlay, storyteller, sandcast and more. Stones were added later as a central stone, a cluster, with other design elements or as inlay. Some conchos are made entirely of a single turquoise stone. Concho belts can be a continuous row of conchos or could have spacers in between the conchos. The spacers can of various shapes but traditionally are butterflies and it is easy to see why they are called that when you look at the shape of them. The conchos and the butterflies are sometimes backed by leather which highlights the silver work and also protects the edges of the silver from bumping, wear or bending. Link concho belts might have from 12 to 18 conchos connected by rings. See Part Two of this series to see how the number of conchos plays out when you want to wear your belt with jeans. Generally there are two types of concho belts: link and leather. Link concho belts are conchos that are connected by rings with a hook fastener at one end. Link belts are used primarily over a blouse but many can also fit through the belt loops of jeans. Link belts generally cost less than leather belts. Today there are many types of Concho Belts sold, some are authentic Native American Made, but many are not. Here is how they stack up. The fine, highly worked museum-quality Navajo or Zuni Hand Made Sterling Silver Concho Belts are truly works of art and are highly collectible, seldom sold, and worn for ceremonial purposes only. They are made by very talented, traditional Native American artists out of the finest stones and Sterling Silver. Sometimes a dozen artists will get together and each will make one concho for a special belt. Some artists might make only one or two concho belts in a year….or a lifetime. Prices are commonly $20,000 and more. Traditional Sterling Silver Leather Concho Belts made by Native American silversmiths and marketed for “using” can be somewhat less complex and less expensive that the museum pieces but they are wonderful pieces of wearable art ! They are equally suitable to wear over a blouse or shirt or with jeans. These are for sale in the $1000-$9000 range. There are all kinds of non-Native American made concho belts for sale. They are often made in a southwestern style from machined steel conchos that are chrome plated. These might sell for as low as $10. A link concho belt that is machine made, not Native American, not sterling silver. Conchos can be of shiny or matte sterling silver, antiqued or highly polished. 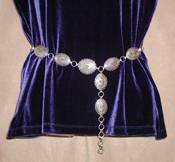 Coin Silver – Some older concho belts are made from coin silver. You can read more about coin silver in my previous post on the subject. Plated Concho Belts might consist of a layer of silver or chrome over steel. “Pot metal” (inexpensive cast metal mixtures) and other metal alloys can also be plated. These kinds of belts are the tourist grade or costume jewelry style belts, a totally different item than Native American Made Concho Belts. To get some ideas on how to get your concho belt ready to wear, read Part Two of this Series – The Art and Science of Wearing a Concho Belt.